The ThinkServer RAID 720i family of 12 Gbps SAS RAID controllers are high-performance RAID-on-chip adapters that offer maximum performance, caching options and advanced tiering and performance software. This product guide provides essential presales information to understand the RAID 720i adapters and their key features, specifications, and compatibility. This guide is intended for technical specialists, sales specialists, sales engineers, IT architects, and other IT professionals who want to learn more about the RAID 720i adapters and consider their use in IT solutions. The ThinkServer RAID 720i family of 12 Gbps SAS RAID controllers are high-performance RAID-on-chip (ROC) adapters that offer maximum performance, caching options and advanced tiering and performance software. These adapters support RAID levels 0/1/10/5/50/6/60, and includes an extensive list of RAS and management features. The ThinkServer RAID 720i AnyRAID Adapter is a 12Gbps ROC adapter in an AnyRAID form factor that is supported on ThinkServer systems with an AnyRAID slot. The adapter supports up to 8 SAS or SATA drives. The ThinkServer RAID 720ix AnyRAID Adapteris the same as the AnyRAID 720i adapter but also includes a SAS expander daughter card to enable the adapter to support up to 28 SAS or SATA drives. 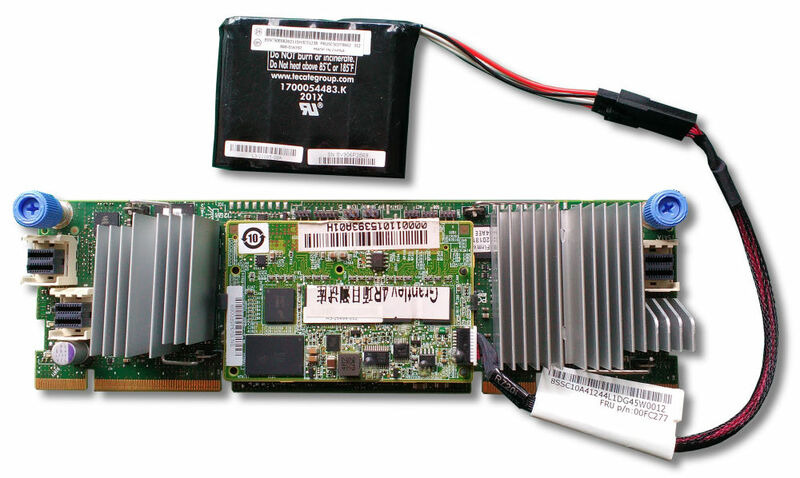 The ThinkServer RAID 720i AnyRAID Adapter is shown in Figure 1. RAID on Chip-based controllers such as the 720i and 720ix adapters have a dedicated processor that offloads all RAID functions from the server's CPU. With hardware acceleration for RAID 5 and 6 operations plus dedicated memory for caching, the 720i adapter family offer the ultimate performance for ThinkServer systems. The following table provides the ordering part numbers for the adapters. * These two RAID 720i option part numbers contain different sets of cables needed for supported servers. See the Server support section to see where each adapter is supported. The following figure shows the Lenovo ThinkServer RAID 720i PCIe Adapter. LSI SAS3108 12 Gbps RAID on Chip (ROC) controller. PCIe adapter: Two internal x4 HD Mini-SAS connectors (SFF-8643). 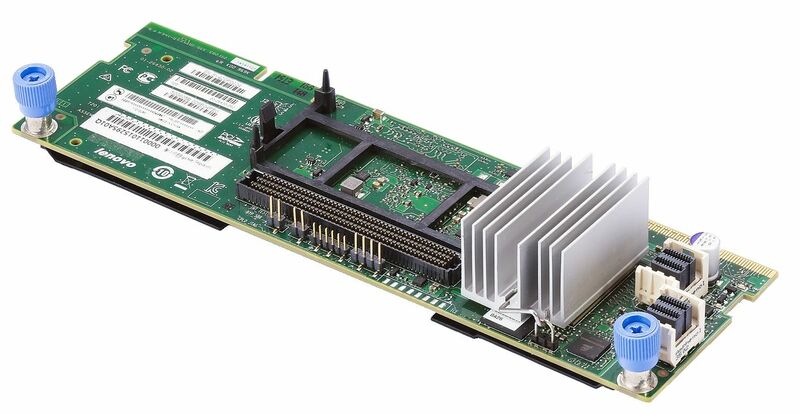 PCI Express 3.0 x8 host interface. Support for SAS and SATA HDDs and SSDs. Support for RAID 0, 1, 10, 5, 50 standard; support for RAID 6 and 60 with one of the optional cache upgrades. The following figure shows the main components and connectors of the AnyRAID adapters. The following table compares the RAID 720i adapters. MegaRAID FastPath software provides high-performance I/O acceleration for SSD-based virtual drives by using a low latency I/O path to increase the maximum I/O per second (IOPS) capability of the controller. This feature boosts the performance of applications with a highly random data storage access pattern, such as transactional databases. FastPath is enabled on the 720i adapters, with or without a cache upgrade installed. Auto-resume uses non-volatile RAM (NVRAM) to save the rebuild progress during a host reboot or power failure to automatically resume from the last checkpoint. Auto-resume ensures that data integrity is maintained throughout the process. The card supports a number of features that can be implemented without rebooting the server. Applications, such as email and web server, benefit from avoiding downtime during the transition. Online Capacity Expansion (OCE) allows the capacity of a virtual disk to be expanded by adding new physical disks or making use of unused space on existing disks, without requiring a reboot. Online RAID Level Migration (RLM), which is also known as logical drive migration, can migrate a virtual disk from any RAID level to any other RAID level without requiring a reboot. System availability and application functionality remain unaffected. Fast initialization quickly writes zeros to the first and last sectors of the virtual drive. This feature allows you to immediately start writing data to the virtual drive while the initialization is running in the background. Consistency check verifies that all stripes in a virtual disk with a redundant RAID level are consistent. The consistency check mirrors data when an inconsistent stripe is detected for RAID 1 and re-creates the parity from the peer disks for RAID 5 or RAID 6. Consistency checks can be scheduled to take place periodically. Management tools provide convenience for the configuration of logical volumes and alerting when errors have occurred or are about to occur. Patrol read is a background sentry service that pro-actively discovers and corrects media defects (bad sectors) that arise normally as a disk drive ages. The service issues a series of verify commands, and if a bad block is discovered, the card's firmware uses RAID algorithms to re-create the missing data and remap the sector to a good sector. The task is interruptible based on controller activity and host operations. The firmware also provides an interface where the patrol read task can be initiated, set up for continuous operation, and terminated from a management application. Patrol read can be activated by a manual command or automatically. A hot spare rebuilds data from all virtual disks within the disk group in which it is configured. You can define a physical disk as a hot spare to replace a failed drive. Hot spares can be configured as either global or dedicated. A global hot spare allows any physical drive to be designated as a hot spare. A dedicated hot spare allows the user to assign a hot spare drive to a particular array of the same drive type. Drive roaming occurs when the physical disks are changed to different ports on the same controller. When the drives are placed on different channels, the controller detects the RAID configuration from the configuration data on the drives. HII is a UEFI utility that is built into the RAID adapters that allows you to configure drive groups and logical drives before installing or booting the operating system. MegaRAID Storage Manager is an easy-to-use advanced RAID management application. It allows you to configure, monitor, and maintain drive groups, virtual drives, and advanced features with an intuitive GUI, reducing administrative efforts and simplifying troubleshooting. Note: RAID 10, 50 and 60 drive groups do not support Online Capacity Expansion and Online RAID Level Migration. RAID 0, 1, 5, and 6 drive groups do not support Online Capacity Expansion and Online RAID Level Migration if two or more virtual drives are defined on a single drive group. With the addition of a cache upgrade additional features are enabled, as listed in the following table. RAID 6 and 60 provide additional protection compared to RAID 5 and 50 by implementing a double-parity configuration. MegaRAID flash cache protection uses NAND flash memory, which is powered by a supercapacitor, to protect data that is stored in the controller cache. This module eliminates the need for a lithium-ion battery, which is commonly used to protect DRAM cache memory on PCI RAID controllers. To avoid the possibility of data loss or corruption during a power or server failure, flash cache protection technology transfers the contents of the DRAM cache to NAND flash using power from the offload power module. After the power is restored to the RAID controller, the content of the NAND flash is transferred back to the DRAM, which is flushed to disk. MegaRAID CacheCade 2.0 read/write software accelerates the performance of hard disk drive (HDD) arrays with only an incremental investment in solid-state drive (SSD) technology. The software enables SSDs to be configured as a dedicated pool of controller cache to help maximize the I/O performance for transaction-intensive applications, such as databases and web serving. CacheCade software tracks data storage access patterns and identifies the most frequently accessed data. The hot data is then automatically stored on the solid-state storage devices that are assigned as a dedicated cache pool. CacheCade requires a cache optoin with flash backup. MegaRAID SafeStore encryption services offer instant secure erase and local key management for self-encrypting drives. This technology represents a step forward in securing data on a disk drive from any unauthorized access or modification resulting from theft, loss, or repurposing of drives. Instant secure erase permanently removes data when repurposing or decommissioning SEDs. SafeStore local key management provides the necessary management and protection of SEDs by using a simple pass phrase, security key identifier, and security key file that can be set and applied to all SEDs that are assigned to a ServeRAID adapter. This feature removes the complexity of managing each SED’s unique encryption key, and it essentially relieves the administrator of most of the daily tasks of securing data. The following figure shows the Lenovo ThinkServer RAID 720ix AnyRAID Adapter with Transportable Flash Module (TFM) cache installed and super-capacitor attached.. The following tables list the ThinkServer systems that are compatible. The ThinkServer RAID 720i adapters carry a 1-year limited warranty. When installed in a supported ThinkServer system, the adapter assumes the system’s base warranty and any warranty upgrades.